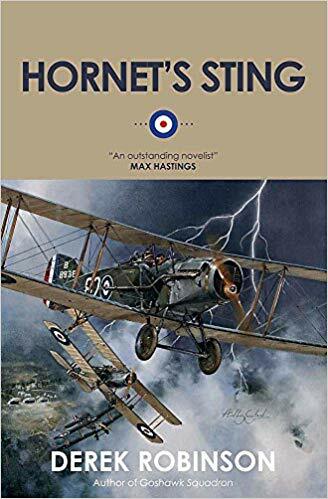 Hornet's Sting is the third novel that I've read recently about the Royal Flying Corps in France in World War One. It is a prequel to the excellent Goshawk Squadron, which I reviewed here. This has many similar themes - though set a year earlier its pilots fly the Bristol F2 flyer and some of the characters from the later book only appear in this one latter on. The introduction of the Bristol F2 was a disaster - depicted here in a horrific scene where five planes are lost as the pilots and gunners strive to use tactics that are brilliant on paper, but terrible in the air. Flying straight and level the gunners are supposed to knock attacking aircraft from the air, but the technical difficulties of this sort of shooting condemn the crewmen to certain death. Captain Woolley, who is the key figure in Goshawk Squadron turns this on its head and orders his pilots to fly the F2 like the fighter it is intended to be. Here, Robinson is using themes that are evident from many of his books - the leadership of the RFC and later RAF are unable to allow themselves to learn from those fighting the actual battles and stick hard to outdated tactics. For Robinson the men flying the planes knew best and should have had more freedom to learn them. In particularly his novel argues that the Deep Operating Patrols over enemy territory were dangerous and unproductive. Either way, the turnover of pilots is shocking. New faces come and go, and few last more than a couple of pages. From their vantage point the pilots know that's its worse on the ground and there's a clever scene when they get to view the water-logged ground ahead of the final Battle of Ypres. As with all of Derek Robinson's novels in this vein there is brilliant dark humour as the men drink and joke their way through the stress and losses of friends. 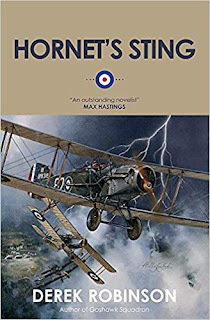 Hornet's Sting doesn't work as well as te earlier books, and I felt that some of the subplots were a little unbelievable, particularly the one that takes place on the other side of the lines. The depiction of air-combat is believable and the senseless waste of war is a constant theme, that underlines a solid novel that isn't quite up to the excellence of other books by this author.